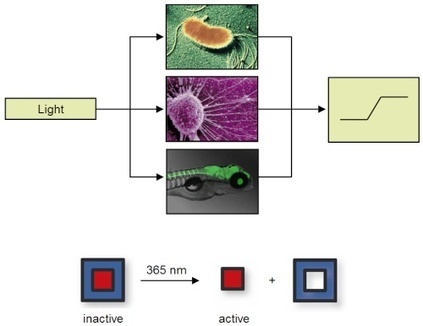 We are developing tools that enable optochemical control of protein, RNA, and DNA function in bacterial and mammalian cells, as well as multicellular model organisms, thus eliciting a defined output signal from the biological system under study by using light as an input signal. All tools are based on a fundamental concept: the blocking of essential functional groups on biologically active molecules with light-removable protecting groups, so called "caging groups". These caging groups are site-specifically installed, rendering the biological target completely inactive, until they are removed through illumination with UV, visible, or IR light. Since light can be controlled spatially and temporally, the activity of the caged molecule can be precisely controlled in location and timing.